This quilt pattern is easy to adapt to whatever size you want to make it, and the soft raw edge applique is a fun, easy effect for beginners to master. 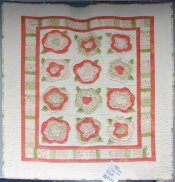 You can make this one with scraps or select a coordinating fabric palette to build your roses, backgrounds and borders. 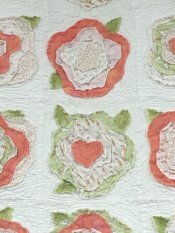 This two day class is for confident beginner level quilters who are comfortable with basic rotary cutting and piecing techniques. Please see the supply list for class prep work so that you can get the most out of your time with the instructor. Please see the supply list for required prep work before class day. This class is for beginner level quilters who are comfortable with basic piecing and rotary cutting techniques.